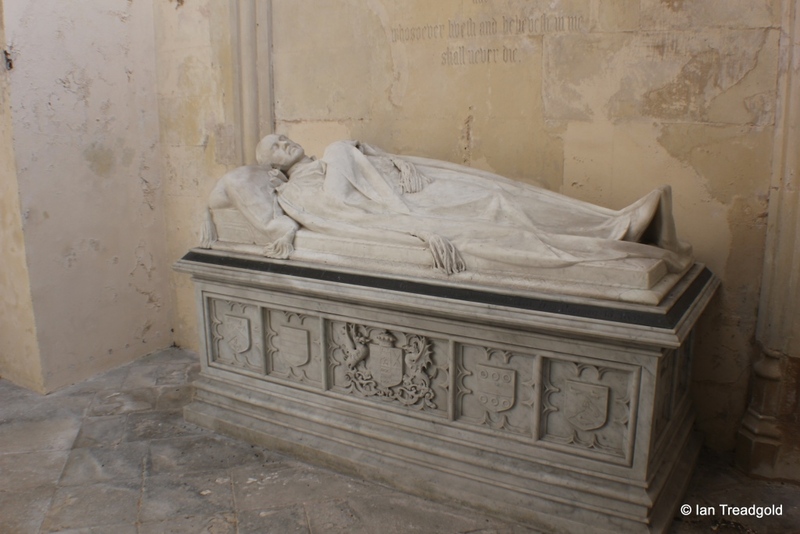 The de Grey Mausoleum attached to the church of St John the Baptist in Flitton is one of the most impressive collections of funerary monuments in the country. For details of the church itself and the location of the mausoleum, see here. Externally the de Grey mausoleum is a drab, nondescript building as befits its funereal function. It is built of brick and predominantly rendered in Roman cement, probably applied in Victorian times. There are few external features although the east window is of note as mentioned on the main Flitton church page. Inside, the mausoleum contains some 20 individual monuments with additional gravestones in the floor. 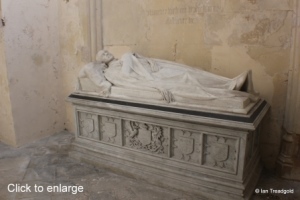 The monuments form one of the finest collections of funerary monuments in England. 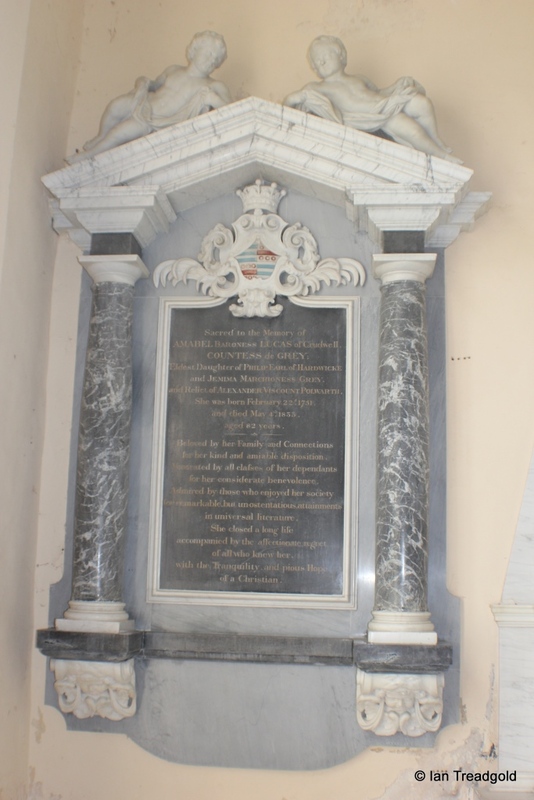 These monuments and the people they remember provide an insight into the de Grey family line of the 17th, 18th and 19th centuries covering around 250 years. The de Grey family seat for much of this time was Wrest Park in nearby Silsoe. Until the building of Silsoe church in 1829, Flitton was the nearest church to the family seat and used by the de Grey family for baptisms and funerals. Thus it was natural that when a mausoleum was built, Flitton was the location chosen. It is not the purpose of this page to give a genealogical history of the de Grey family but some references to family relationships are necessary to try and understand the monuments and their occupants. It is believed that none of the tombs are occupied with their occupants buried in vaults beneath the floor of the mausoleum. The builder of the initial mausoleum was Henry de Grey the 6th Earl of Kent who died in 1615. He was the second son of Henry de Grey who in turn was the son of Henry de Grey the 4th Earl of Kent. It is worth noting that Henry does seem a popular name in the de Grey family! The 6th Earl succeeded to the title on the death of his brother Reynold, the 5th Earl, in 1573. He also held the title of Lord Lieutenant of Bedfordshire and 9th Baron Grey of Ruthyn. The 6th Earl was primarily responsible for restoring the fortunes of the de Grey family after an earlier Earl had lost most of the estates through extravagant living and gambling. Born in 1541, he was knighted in 1570 and became a member of the Queen’s Household. He was one of the commissioners who passed the death sentence on Mary Queen of Scots in 1587. Indeed, along with the Earl of Shrewsbury he was tasked with visiting Mary to break the news of her sentence. Along with the residence at Wrest (an earlier building rather than the current house) he owned properties in Blunham in Bedfordshire, Kew and a house in the Barbican in London. 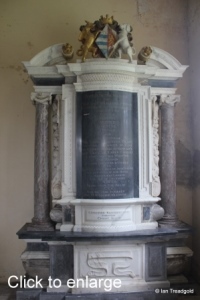 Henry’s will stated that the monument was to celebrate both this achievement and to act as a reminder to his descendants about the consequences of excessive living. 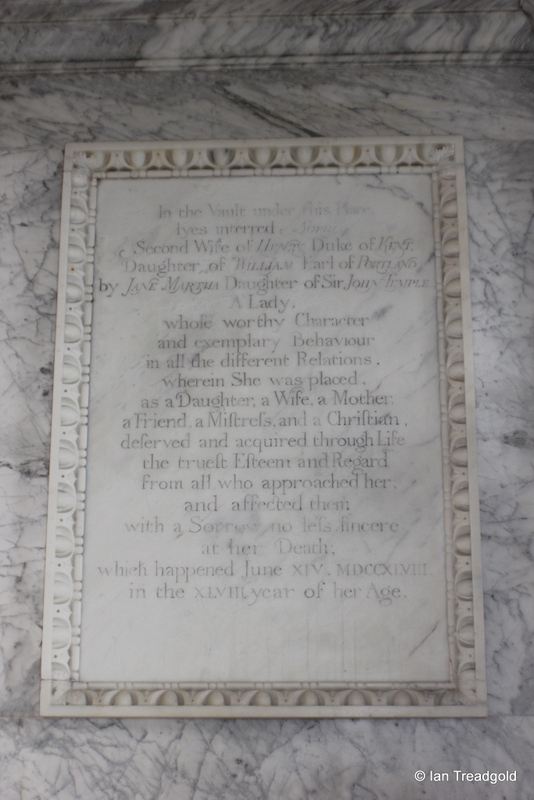 The 6th Earl was married to Mary Cotton (d. 1580) who was the daughter of Sir George Cotton of Combermere in Cheshire and widow of the 3rd Earl of Derby but they had no children. The richly coloured chest tomb monument is of multi-coloured alabaster and is the earliest monument in the mausoleum. It depicts the 6th Earl and his wife in traditional poses of the Jacobean style, formally dressed and in prayer awaiting resurrection. 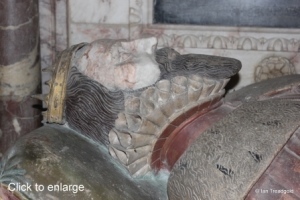 The painted effigies are lifelike but very stiff in appearance. 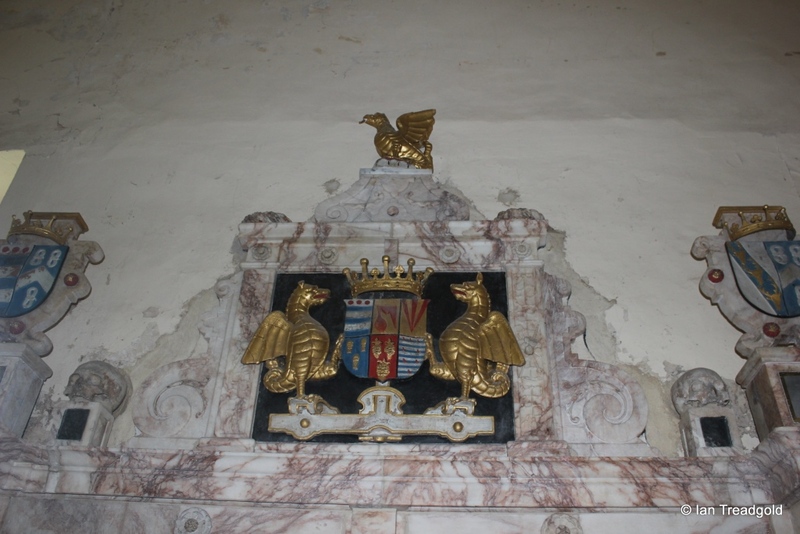 Above are heraldic symbols including a golden wyvern, an image associated with the de Grey family. On either side of the wyverns are skulls which are believed to be genuine. 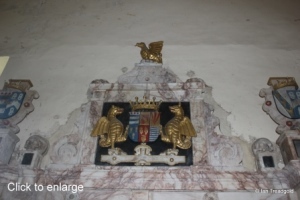 The crest at the top of the monument was probably added later and between the two wyverns shows the de Grey coat of arms in the top left of the six. The other arms on the shield reflect alliances by marriage including the Valence (top centre) and Hastings (bottom right) families. Charles was the younger brother of the 6th Earl and was born around 1545. Prior to succeeding to the title on his brother’s death he was part of the household of the Archbishop of Canterbury from 1559 to 1575. He also became Lord Lieutenant of Bedfordshire in 1615. He married Susan Cotton and had two children. His son Henry succeeded him as the 8th Earl. 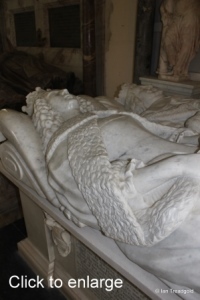 He died in 1623 at the manor house in Blunham and is buried in the mausoleum. 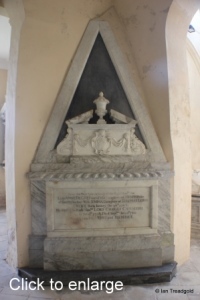 He has no monument and his remains are buried in a vault under the mausoleum with a gravestone above, to the left of the monument of the 6th Earl. The 8th Earl was the son of Charles, the 7th Earl and born about 1583. He became an MP and was jointly Lord Lieutenant with his father and after the 7th Earls death, jointly with the Earl of Cleveland. He married Elizabeth Talbot, the daughter of the 7th Earl of Shrewsbury in 1601. He died childless in 1639 in London and is buried in the vaults under the mausoleum with a gravestone above, next to his father. His wife Elizabeth outlived him until 1651 and after his death, married John Selden a scholar and intellectual. When she died she was buried in Flitton. 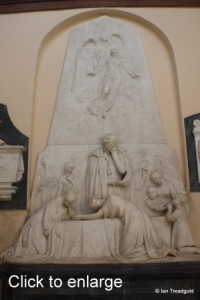 She is commemorated with a marble wall monument near her husband’s gravestone. With the 8th Earl dying childless, the title passed back through the family tree to a line descended from Anthony the brother of the 4th Earl. Anthony was 82 when he inherited the title and had already married Magdalen Purefoy from Warwickshire in 1590. 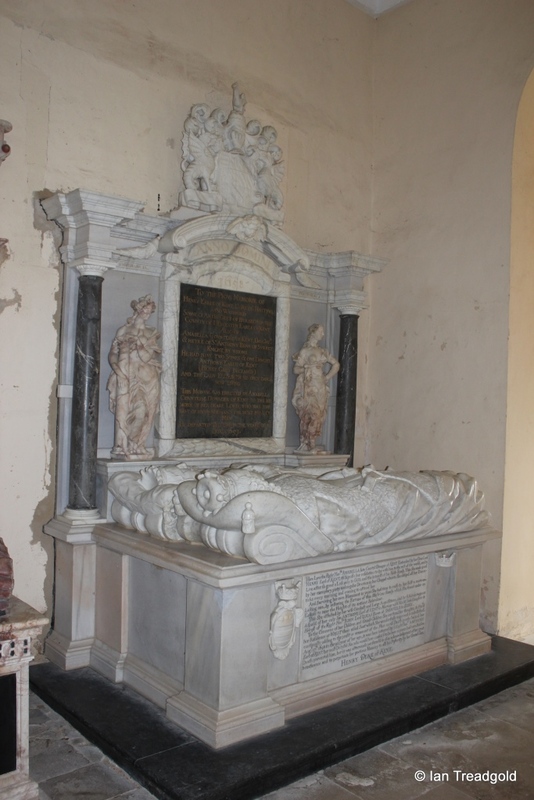 He had six sons and five daughters with Magdalen and died at Burbage, near Hinckley in Leicestershire in 1643. 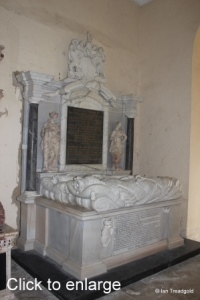 Both he and his wife are buried at Burbage. Henry was a son of the 9th Earl and born in Burbage. He achieved high political office in the 1640’s and also served as Lords Lieutenant for Rutland and Bedfordshire. He married a widow Amabel Fane neé Benn in 1644 and they had three children, two sons and a daughter. 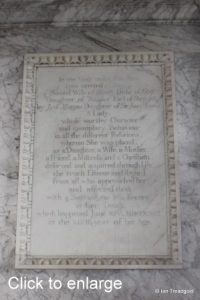 Amabel’s mother, Lady Jane Hart who died in 1671 aged 83 is also buried in the mausoleum. 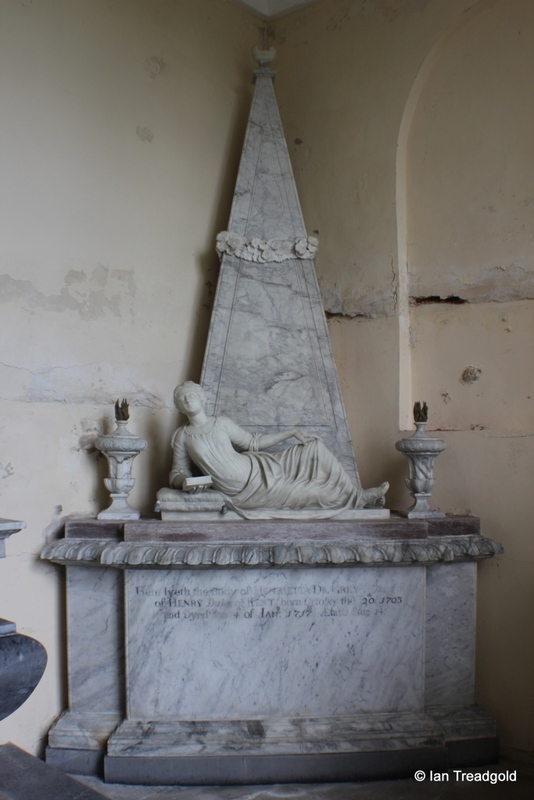 Her monument is of marble showing a semi-reclining figure, presumably Lady Hart. The 10th Earl died in 1651 and his wife Amabel survived him until 1698. 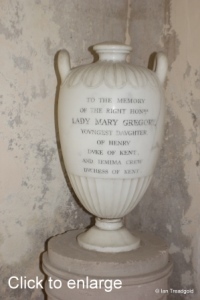 Locally known as the Good Countess, she helped to restore the fortunes of the family. She lived to be 92. 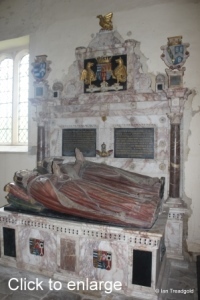 Their monument is of black and white-grey marble with recumbent effigies of Henry and Amabel. 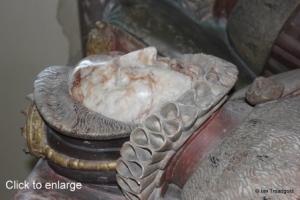 In contrast with the tomb of the 6th Earl, there is less colour but just as much attention to detail with classical imagery becoming apparent in the form of cherubs. 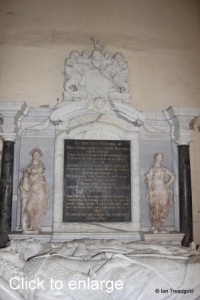 This monument dates from 1658. Anthony was the second son of the 10th Earl and succeeded to the earldom at the age of six on the death of his father with the estate being managed by his mother. He married Mary Lucas who was the daughter and sole heir of Lord Lucas of Shenfield in 1663 when he was just 18. They had two daughters who died unmarried and a son, Henry. Anthony was a pall bearer at the funeral of Queen Mary II in 1694 and a sword bearer at the coronation of Queen Anne. 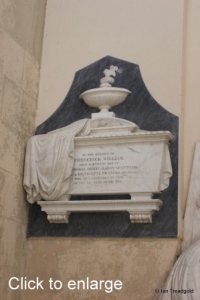 He died suddenly in Tonbridge in Kent whilst playing bowls on the 9th August 1702. He was survived by his wife for only two months before she also died. 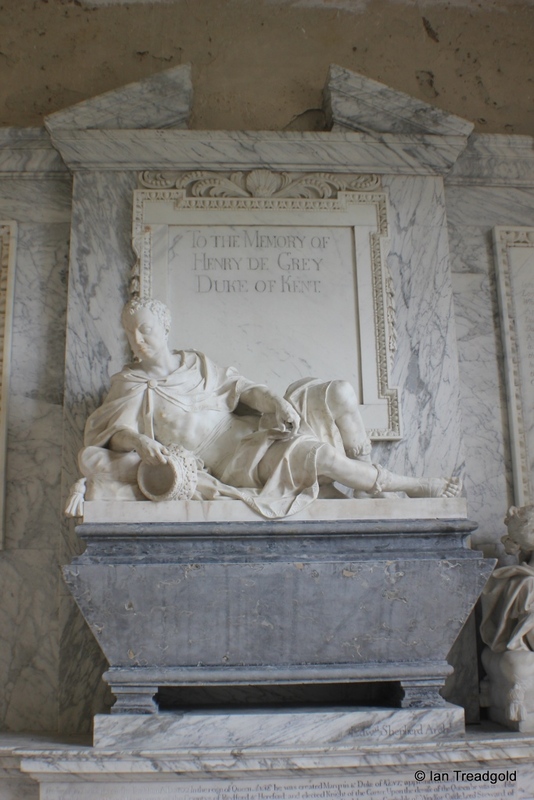 Henry was born at the family home of Wrest Park in 1671, the eldest son of the 11th Earl. When he was 18 he embarked on grand tour of Europe for around two years. Soon after his return, he married Jemima Crewe, daughter of Lord Crewe of Stene in Northamptonshire. 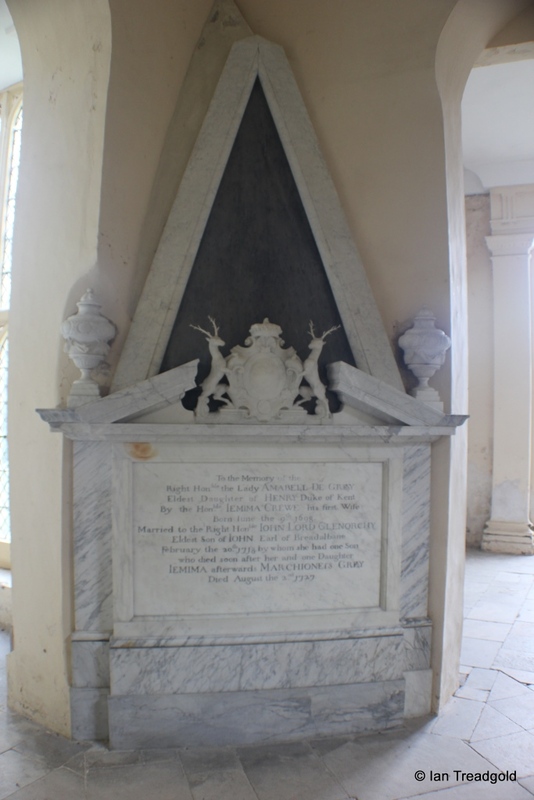 She bore him four sons and seven daughters before she died in 1728 aged just 35. 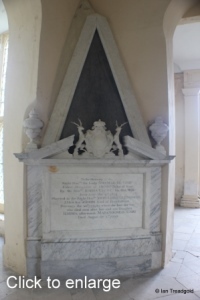 Her memorial in the mausoleum is to the right of her husband’s in the east wing. She is depicted in a reclining pose. After Jemima’s death the Duke married again to Sophia, daughter of the Earl of Portland. She bore him two further children and she survived the Duke by eight years. Her memorial is to the left of Henry’s and has no statue. The Duke was desperately unlucky with his children, of the eleven borne by Jemima, nine died before he did. 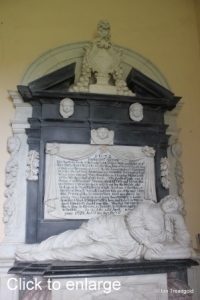 The eldest son who was Anthony, Earl of Harrold died just 27 in 1721. 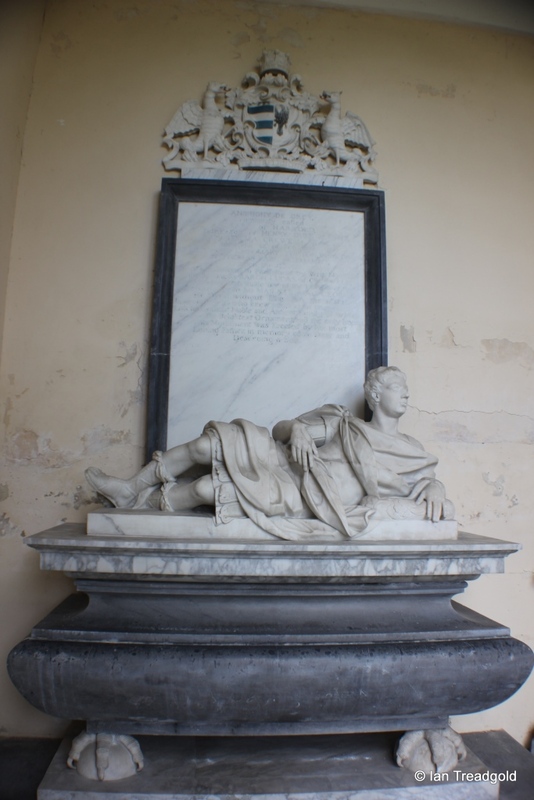 His monument depicts him in Roman armour, reclining on his tomb in a lifelike pose. The inscription mentions the “unspeakable Loss to his most Noble and Ancient Family of which he was the Brightest Ornament and only hope”. 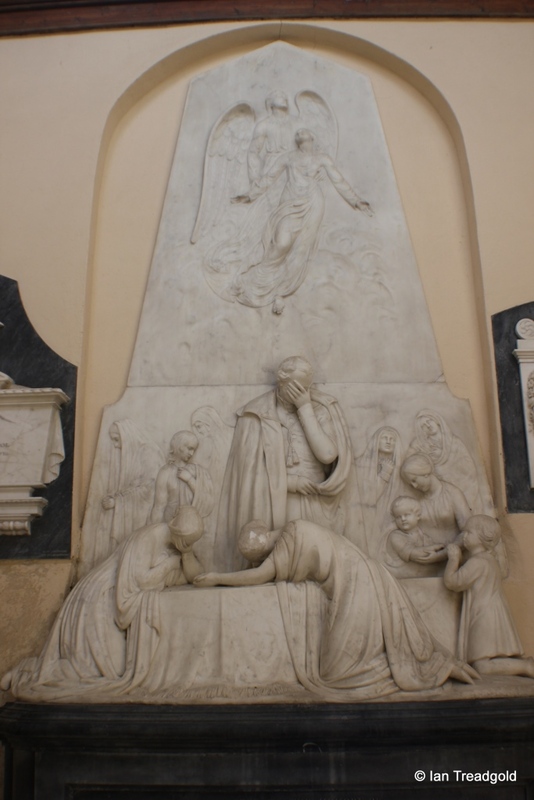 The use of classical imagery shows the evolution of funeral monuments away from the explicit religious imagery of earlier periods. His second son, Henry, died in 1717 when he was just 20 and his monument in the mausoleum is in the north-east corner of the north wing and depicts Henry reclining on his tomb. 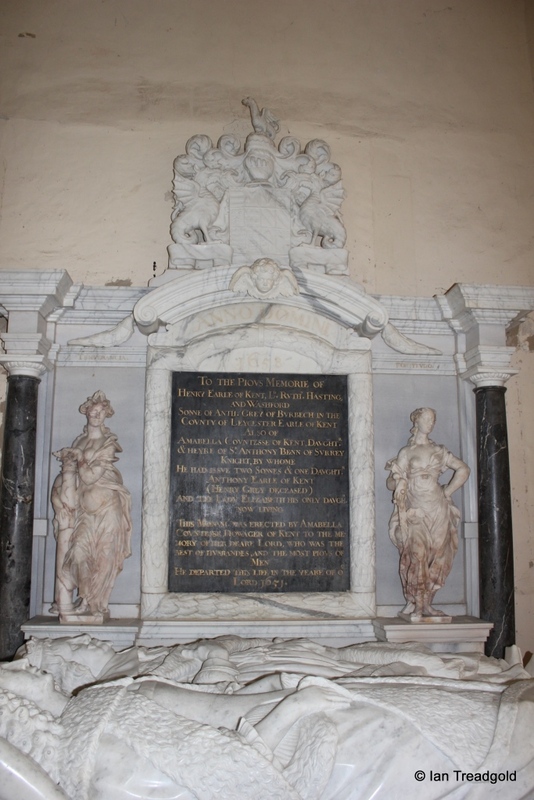 Henrietta also died in 1717, just 14, and her monument is opposite her brother Henry’s and next to Anthony in the north wing. 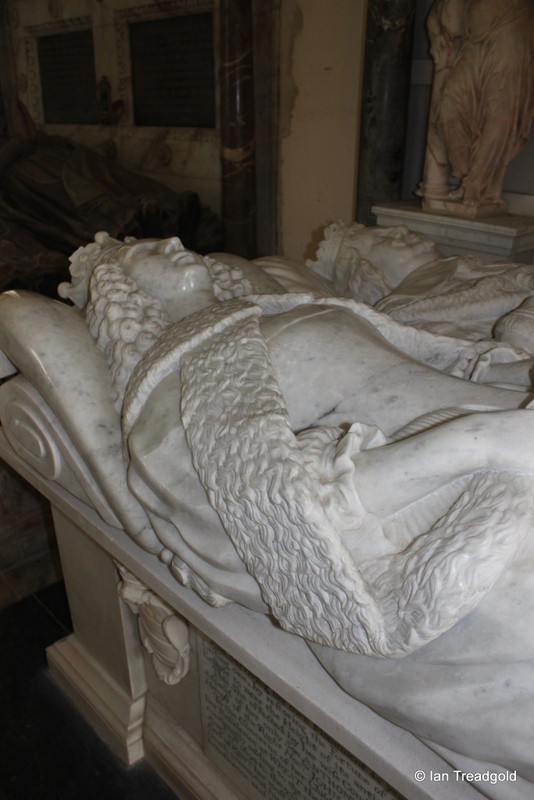 Both Henry and Henrietta are depicted rightfully as youthful figures reclining on marble plinths with a pyramid of grey marble behind. Amabel was his eldest daughter and became Lady Glenorchy. She married John Campbell, 3rd Earl of Breadalbane in Scotland. Their daughter Jemima became Marchioness Grey as the male line of succession had died out. 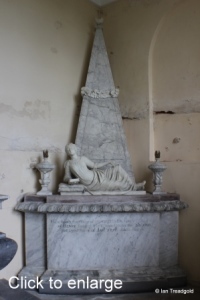 Amabel died in 1727 and her monument is in the centre chamber of the mausoleum. Her sister Anne married into the Cavendish family before she died in 1733. 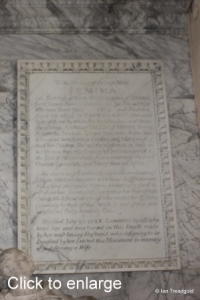 Her memorial is also in the central chamber with Amabel. 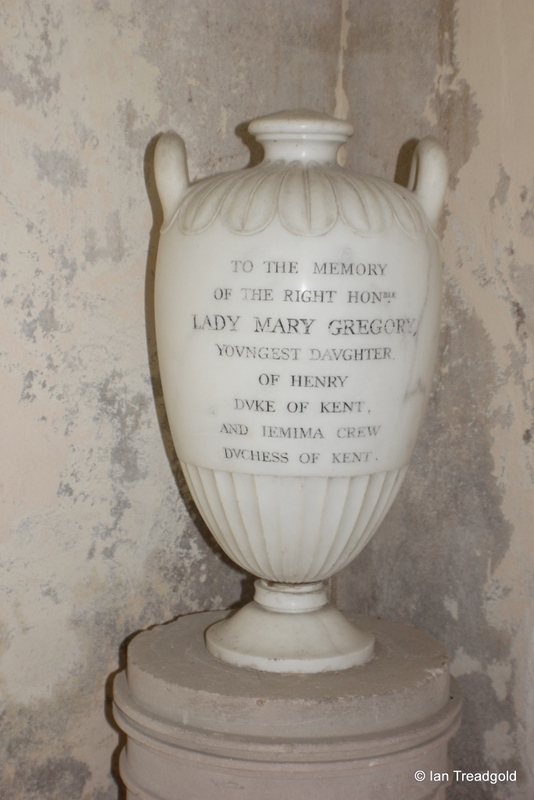 The youngest daughter, Lady Mary Gregory died in 1761 and she is remembered with a memorial in the form of a Greek urn in the north chamber. Henry’s imposing monument occupies the north wall of the eastern chamber between those of his wives. 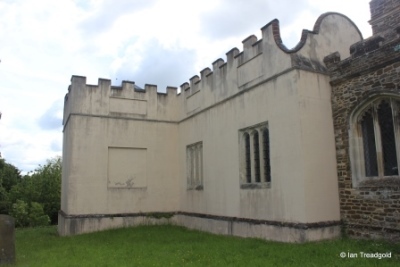 Henry had extended the building to its cruciform shape between 1705 and 1710 for which his grandmother, Amabel wife of the 10th Earl had left some £300 in her will probably worth some £5 million today. Henry had risen to high political office and regarded as a ‘safe pair of hands’ in court circles being rewarded with the title Duke of Kent in 1710. He also carried out extensive works at Wrest Park laying out the formal woodland garden which survives to this day. Knowing he would die without an heir, the 12th Earl had petitioned Queen Anne for a new title and so, upon Henry’s death, the title passed to Jemima as Marchioness Grey. She married Philip Yorke, 2nd Earl of Hardwicke and they had two daughters. 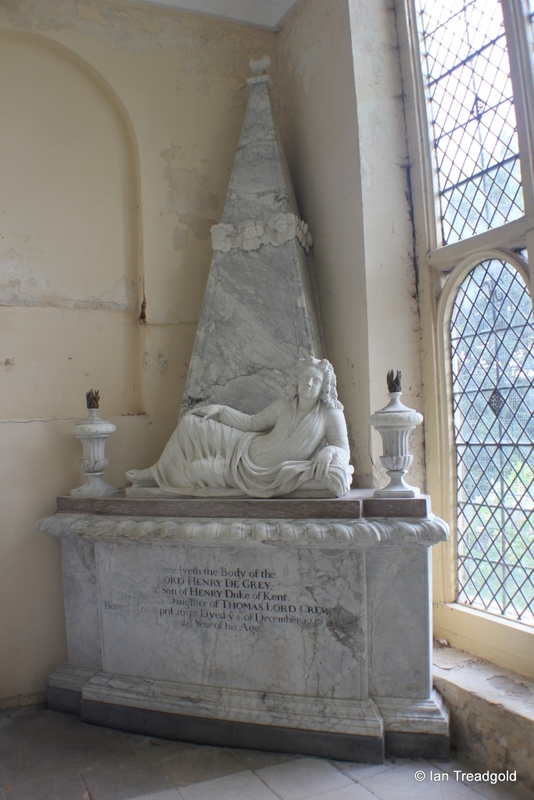 Jemima died in 1797 and has no monument but her husband who died in 1790 is remembered by a memorial of a seated mourning woman with an urn in front of an obelisk in grey and white marble. This reflects further changes in tastes of funeral monuments. No longer are depictions of the departed used but generalised imagery is becoming prevalent. 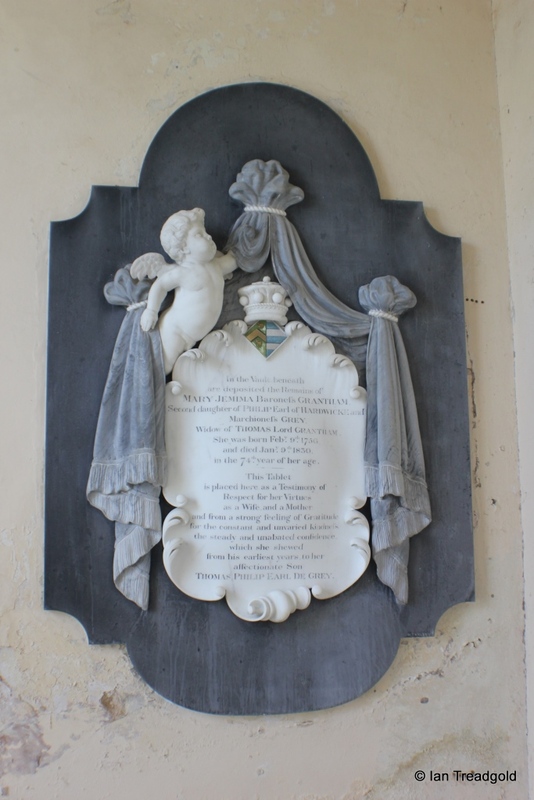 Jemima and Philip’s daughters were Amabel Hume-Campbell Countess de Grey and Mary Jemima Grey. 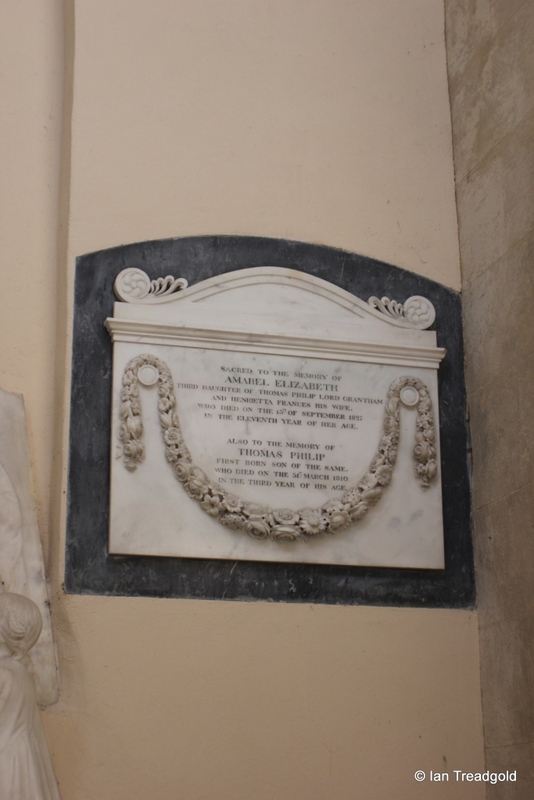 Amabel died in 1833 aged 82 and is remembered with a wall memorial in black, white and grey marble. 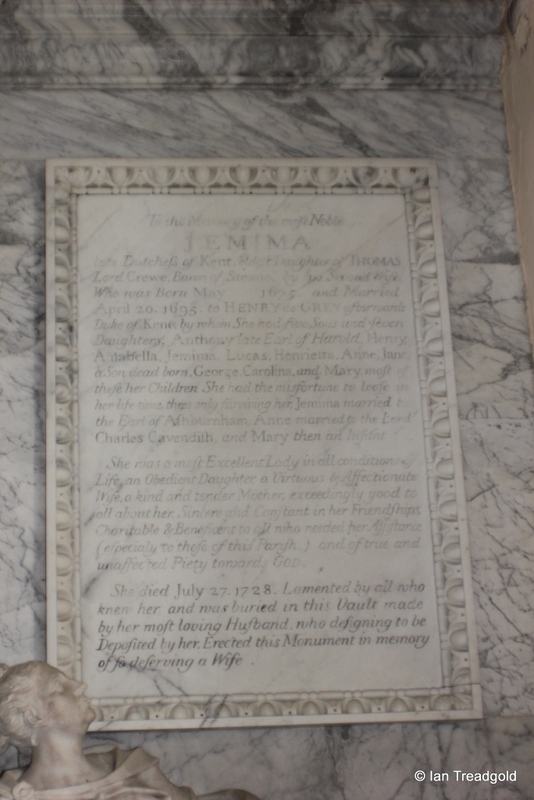 Mary Jemima died in 1830 having married Thomas Robinson, 2nd Baron Grantham. 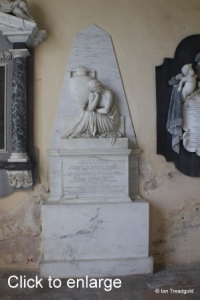 She is remembered with a wall memorial also in black, white and grey marble with drapery and a cherub on the other side of their father’s memorial. Mary and Thomas had a son Thomas Philip who became the 2nd Earl de Grey. Born in 1781 at Whitehall he initially became 3rd Baron Grantham on his father’s death in 1786. He gained the title of the 6th Baronet Robinson of Newby in 1792 on the death of his cousin the 5th Baronet. He succeeded his aunt Amabel on her death in 1833 to become the 2nd Earl de Grey. He was a keen amateur architect and designed the new mansion at Wrest Park which was completed in 1838 with the old house being demolished and removed by 1840. The Earl held various political and ceremonial offices during his life and was appointed Knight of the Garter in 1844. He was President of the Society of Architects from 1834 until his death in 1859 and was made a Fellow of the Royal Society in 1841. He married Henrietta, daughter of the 1st Earl of Enniskillen in 1805. 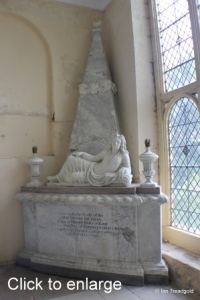 Henrietta died in 1848 in London and her memorial at Flitton is of black and white marble and is a classic Victorian depiction of death with the family grieving around a draped coffin whilst her soul ascends to Heaven carried by an angel. 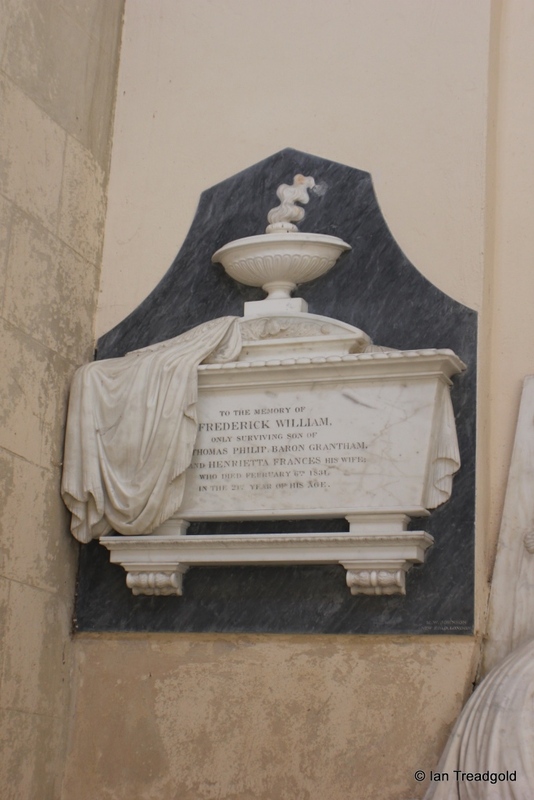 They had two sons but only one reached maturity, Frederick William and he is remembered with a wall monument to the left of his mother. 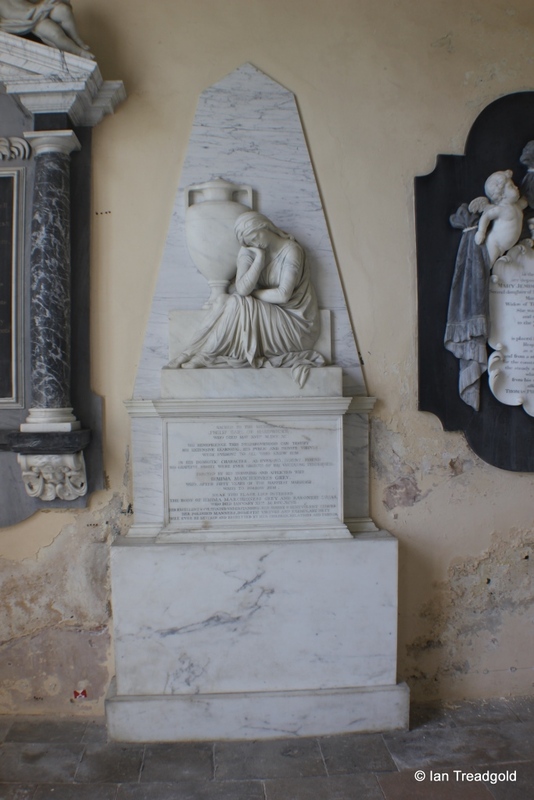 To the right is a monument to Amabel Elizabeth who was the third daughter who died aged just eleven. 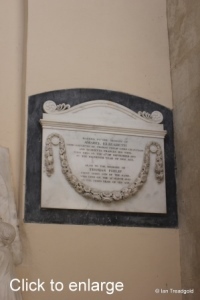 This monument also remembers Thomas Philip who died before he was three. 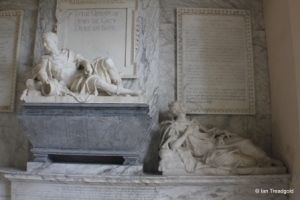 The 2nd Earl is remembered with an elaborate chest tomb in the same south chamber of the mausoleum as his wife and children. 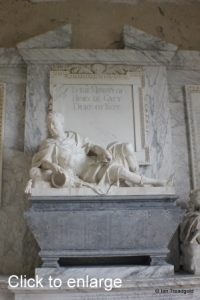 He is depicted as a recumbent effigy in white marble on a grey marble tomb chest reflecting the imagery of the oldest tomb in the mausoleum, that of the 6th Earl of Kent . 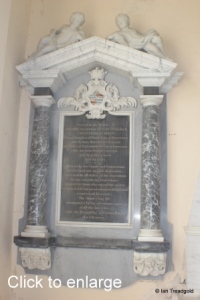 His burial in 1859 was the last burial in the mausoleum and upkeep of the mausoleum was continued by the Parish Council until 1978 when it passed to English Heritage. Page last changed 05/06/2015. Reformatted 19/02/2016.